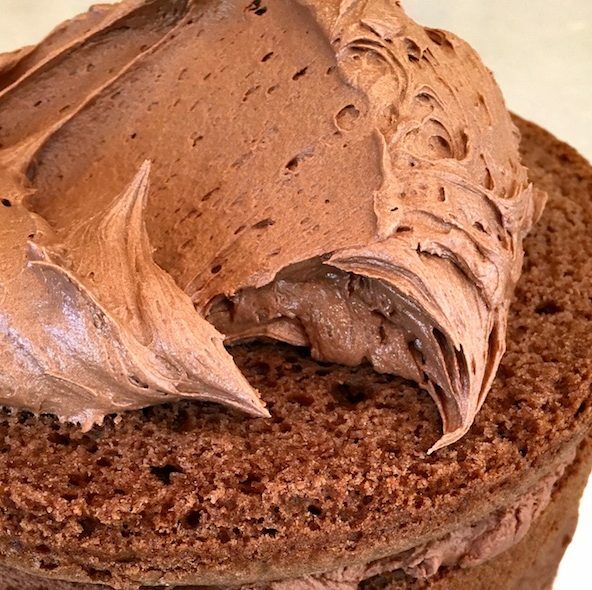 Milk Chocolate Frosting makes the perfect chocolatey swoops and swirls on your cakes and cupcakes. I've got a tip that will guarantee a rich chocolate flavor every time! In the microwave or on in a saucepan, melt together ½ cup of the butter (1 stick) cocoa and milk and stir until smooth. Cool slightly. In another large bowl, beat remaining butter and vanilla together, then add cooled cocoa mixture. Add confectioners' sugar 1 cup at a time, blending with each addition, until frosting is smooth and creamy. For a stiffer frosting for piping use all 8 cups of sugar, and for a softer frosting for swooping on a cake, use 7 cups confectioners' sugar. Melting the cocoa and butter together activates the chocolate flavors in the cocoa. It also helps make the frosting smooth and creamy.